392 pages | 17 B/W Illus. 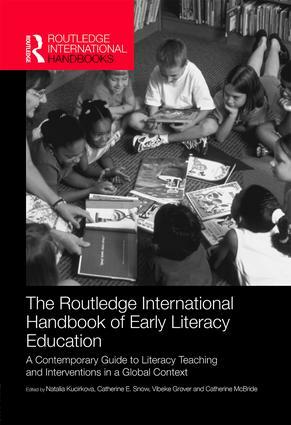 The Routledge International Handbook of Early Literacy Education offers a pioneering overview of early literacy provision in different parts of the world and brings together interdisciplinary research evidence on effective literacy teaching to inform current and future practice and policy of early literacy. From the problem of identification of literacy difficulties in a particular learning context to supporting the provision of early literacy through digital media, the handbook deals with the major concerns and newest areas of interest in literacy research. With an international and future vision, it provides an accessible guide to the main debates and future trends in the global field of early literacy, and informs academics, policy-makers, practitioners, educators and students about innovative early literacy research methods and instruction. The three sections and 30 ground-breaking chapters reflect a conceptual framework of questions asked by scholars and educators interested in looking beyond traditional definitions of literacy. Part I provides contemporary insights collected by internationally renowned scholars on what literacy is, and what it can offer to young children in the twenty-first century. Part II is a collection of detailed portraits of 14 countries, regions or language communities, and focuses on early literacy provision, practice and policy from across the world. Part III outlines key interventions and research-endorsed practices designed to support home–school connections and children’s reading and writing skills, as well as vocabulary, phonological awareness and narrative abilities, with examples drawn from various home, school and community environments. All chapters promote discussion, critical analysis and questions for reflection and are written in jargon-free language in an easy-to use themed format. This handbook is an indispensable reference guide for practising teachers and student teachers, especially those undertaking postgraduate qualifications, as well as early literacy researchers, policy-makers and school-based literacy leaders. "The new Routledge International Handbook of Early Literacy Education is well-timed and rightly targeted at current cultural and linguistic super-diversity. The wide collection of chapters present new developments in old debates as well as new approaches to urgent social and cultural challenges. The broad overview of instruction methods in different languages, orthographies and education systems, is a rich and up-to-date resource for educators and researchers who wish to expand their knowledge and intervention repertoire. The Handbook identifies several topics for research that need urgent attention, including the facilitative and problematic aspects of digital devices, also in view of linguistic super-diversity, the forms of oral language use in early childhood programs that support literacy development best and the role of bilingual children’s first languages in second language literacy. Following these suggestions will strengthen early literacy education as an innovative international research and development program." - Paul Leseman, Professor of Education, Utrecht University, the Netherlands. "Global education is in dire need of scalable solutions to the crisis of learning. This stellar collection of the latest science that can inform strategies to foster literacy development is an important contribution. It will provide invaluable guidance to governments, NGOs and scholars worldwide on how to shift schooling from access to learning and truly fulfill the promise of education for all." - Hirokazu Yoshikawa, Courtney Sale Ross Professor of Globalization and Education, New York University, USA. "This is a timely and remarkable volume. Early childhood education is of global concern yet researchers have no comparable collection of solid empirical research. Chapters are written by exceptional authors, cover an astonishing number of countries, and deal with issues of pressing concern. It will play a pivotal role in facilitating conversation within the global early childhood community." - David Dickinson, Margaret Cowan Chair and Professor of Teacher Education, Department of Teaching and Learning; Associate Dean for Research and Strategic Planning at Peabody College, Vanderbilt University, USA. "This ambitious handbook includes contributions from early childhood educators from around the globe in a contemporary exploration of literacy in very different contexts. Led by internationally renowned scholars and emergent researchers it provides a comprehensive account of what early literacy development looks like in nations as diverse as New Zealand, Poland, India, USA, Norway, Canada, Israel, China, UK, Nordic and African countries and more. The wide representation of authors ensures that research which may not previously have been cited is included here. The volume tackles ‘hot topics’ such as multi-literacies, phonemic awareness, vocabulary development as well as exploring seminal and current literature on continuing central areas in the early years, such as scaffolding, socio-economic disadvantage, bilingualism and so on. It will be a go-to resource for doctoral students and early childhood teacher educators as it provides a thorough, balanced discussion of key theories, debates and emergent themes in the field." - Barbara Comber, Research Professor, School of Education, University of South Australia. Natalia Kucirkova is Senior Research Fellow at University College London, UK. Catherine E. Snow is Patricia Albjerg Graham Professor of Education at the Harvard Graduate School of Education, USA. Vibeke Grøver is Professor of Education at the University of Oslo, Norway. Catherine McBride is Professor of Psychology at The Chinese University of Hong Kong.